Vale Royal Lions have been serving the local community for 42 years and, during that time, have raised around £500,000, 100% of which has been used in their “service” work. 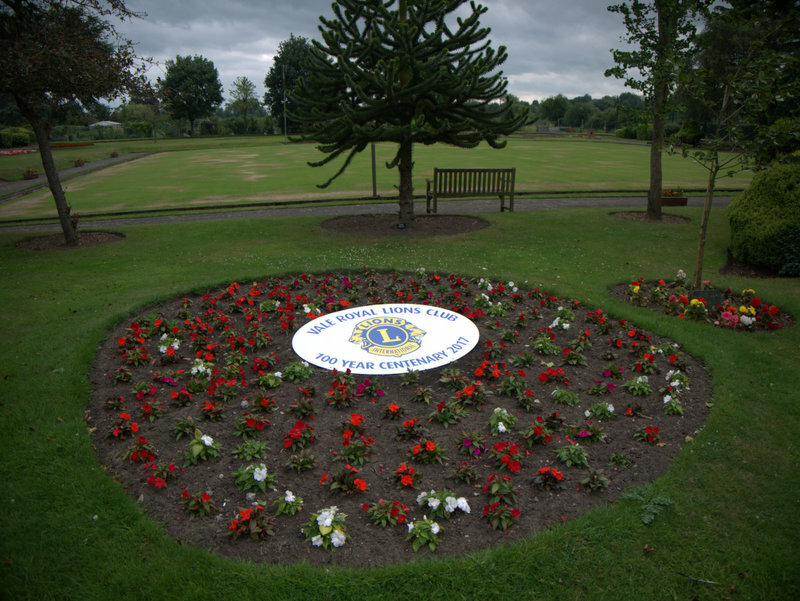 This local club is part of Lions Clubs International, the largest service organisation in the world with over 1.4 million members in over 46,000 clubs in over 200 countries. Founded by Melvin Jones in Chicago, U.S.A. in 1917, Lions are celebrating their Centenary, 100 years, in 2017. Challenges have been set for this centennial period, one of which is to serve over 100,000,000 people around the world. The current count is well over 166,000,000 and the period does not end until June 2018! Nearer to home, Lions in the British Isles also set many targets such as collecting 1,000,000 pairs of used spectacles which are checked and recycled for use in other parts of the world, planting 100,000 bulbs and raising funds for the training 14 Hearing Dogs for Deaf People. Vale Royal Lions have played their part by collecting and dispatching over 6,000 pairs of spectacles for recycling, planting 8,000 bulbs locally including at the NeuroMuscular Centre in Winsford and the Joshua Tree site, and, with other clubs in their district, raising over £11,000 for the training of a Hearing Dog. Being part of an international organisation has its benefits. Because we are local, we serve the unique needs of the community in which we live. As we are global, we can address community challenges wherever they occur. Although our service and support work can be widely categorised as being involved with Health and Youth issues, looking at the specifics illustrates the wide range of assistance that we provide. During the last year we have assisted a local man, who was in need of a life-changing operation, with a donation of £1,000 towards his costs and a similar amount was given to a local family who needed to build downstairs living accommodation for their child with disabilities. We arranged a day out at Petty Pool College with fun on their facilities for a group of local young carers whilst at the other end of the age scale, a Christmas party with lunch was organised for around 20 senior citizens and Christmas hampers were delivered to other elderly within our locality. Lions are committed to their Service work but they also enjoy many social events throughout the year. A visit to the Wedgwood Factory in Stoke on Trent was recently enjoyed by several members, as was an evening at Belle Vue Racing arena. Often their fund raising occasions have a strong social flavour, such as a recent Neil Diamond Tribute event at which they savoured good food and danced the night away, whilst raising around £1450 for the Joshua Tree charity. Meeting twice each month and engaging in their Service work, Lions become good friends and look forward to spending leisure time together. Members of Lions are volunteers who primarily provide a Service to the local community. Membership is a commitment to give some of your time to help others but this generates a sense of achievement and offers an immediate group of like-minded people who become friends with an active social calendar. With the challenge facing Lions this year, they would welcome enquiries from anyone who thinks that they may be interested in joining them. To have a chat with a Lion, simply phone 0845 833 8496. 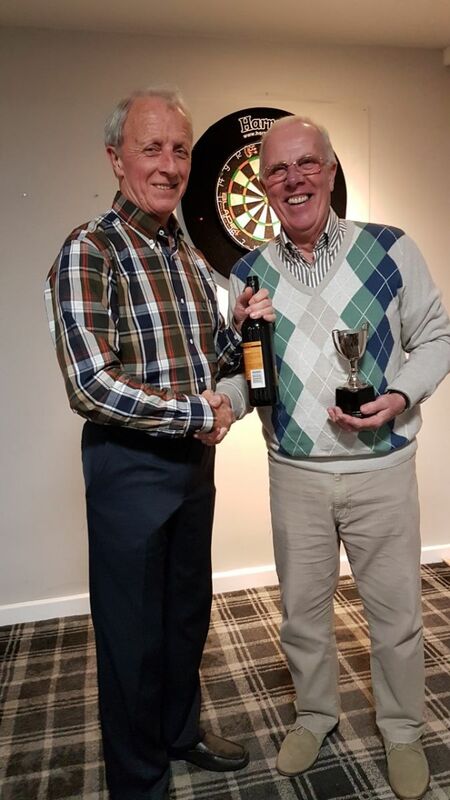 Vale Royal Lions recently held their annual Pairs Bowling Competition and, despite inclement weather, the event was well supported. It was held on September 3rd 2017, hosted by Cuddington Bowling Club and supported by over 50 bowling enthusiasts. Members of Lions provided tasty barbeque food together with tea and cakes, making it an enjoyable social occasion. 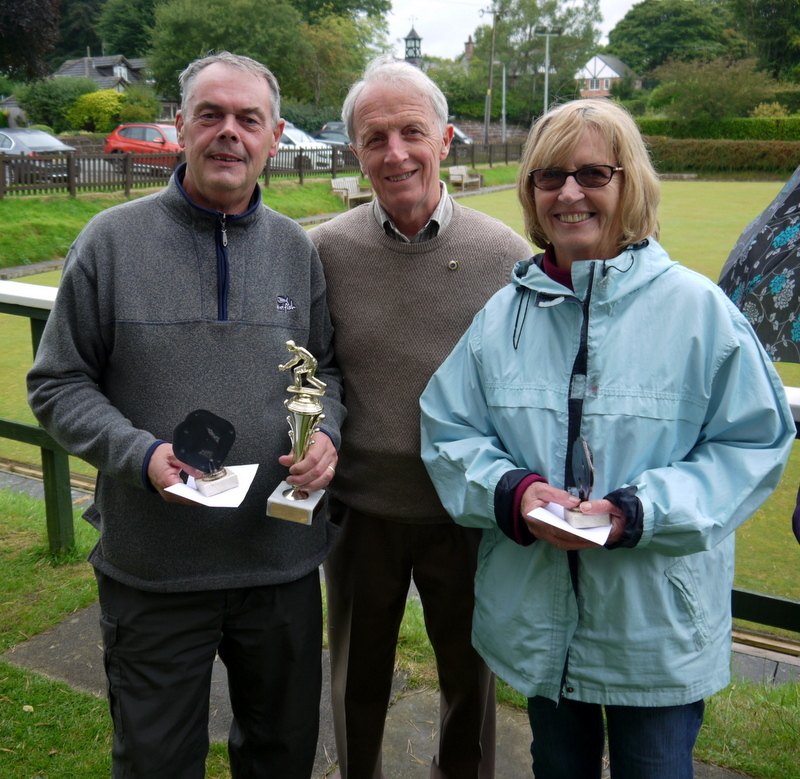 The winning pair was Frodsham Red Lion bowler Dave Williams partnered by Margaret Burmah of Moulton British Legion Bowling Club who won through in a demanding final. Lion president Rob Brown, pictured with winners Dave Smith and Margaret Burmah, presented the awards and congratulated them on their performance. Vale Royal Lions were delighted to induct new member Colin Mason at a recent club meeting. Colin had previously attended a few meetings to learn about Lions work in the community and to meet existing members. He is now looking forward to becoming actively involved in the fund-raising and welfare work of the club and, of course, joining in the varied social events with his new colleagues. The photo shows Lion President Rob Brown, Lion Colin Mason and Lion Andy Benson, who sponsored Colin. Anyone who has an interest in joining Lions should make contact on 0845 833 8496 or via their website www.valeroyallions.co.uk ; they can be sure of a very warm welcome. 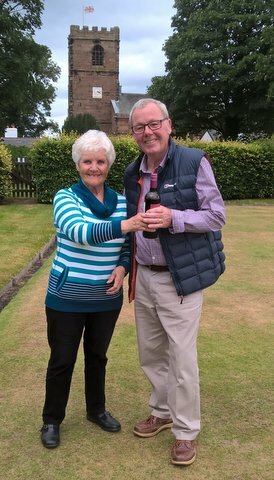 The Lions annual Bowls Challenge event took place on Sunday June 25th 2017 at the Red Lion public house in Little Budworth. It was well supported and, with over-cast skies and a forecast of improving weather during the afternoon, it was decided to enjoy lunch first and then play bowls. As always, the Red Lion provided good food and, with energy levels raised, all proceeded to the green to commence play. With many participants playing bowls infrequently, it was left to expert Myra to organise the games and ensure that rules were applied and scores were recorded correctly. Although a social and friendly event, competition was keen and the measure was used often to ensure correct scores. The winner on this occasion was Dennis O’Byrne and he was presented with his prize by organiser Myra Sales. With good food, good company and an enjoyable game of bowls, all agreed that the day had been a great success. Sporting ability is now an annual challenge within the social calendar for Vale Royal Lions, with bowls and darts featuring each year. The darts event was held at Barnton Cricket Club facilities on Tuesday October 24th 2017 and was well attended by over 12 Lions, family and friends there to enjoy the occasion. We all enjoyed a hotpot supper and plenty of time to chat and catch up with Lion colleagues and friends. Everyone agreed that it was a great event.